While Switzerland is one of the world’s most market-oriented nations, ranked #4 by Economic Freedom of the World, it’s not libertarian Nirvana. Moreover, while the Swiss tax code is benign compared to what exists in other European nations, it also is not perfect. One of the warts is a wealth tax, which is a very pernicious levy that drains capital from the private sector. Let’s look at some excerpts from a report in the Wall Street Journal, starting with a description of the Swiss system. Switzerland has taxed wealth since the late 18th century. Its 26 cantons in 2014 levied taxes on net wealth with rates varying from 0.13% in the lighter taxing German-speaking parts to 1% in French-speaking Geneva. Swiss wealth taxes are also special because they apply from wealth as low as 25,000 Swiss francs, ensuring large swaths of the middle class incur them. Typical taxpayers pay a rate of just over 0.5%. 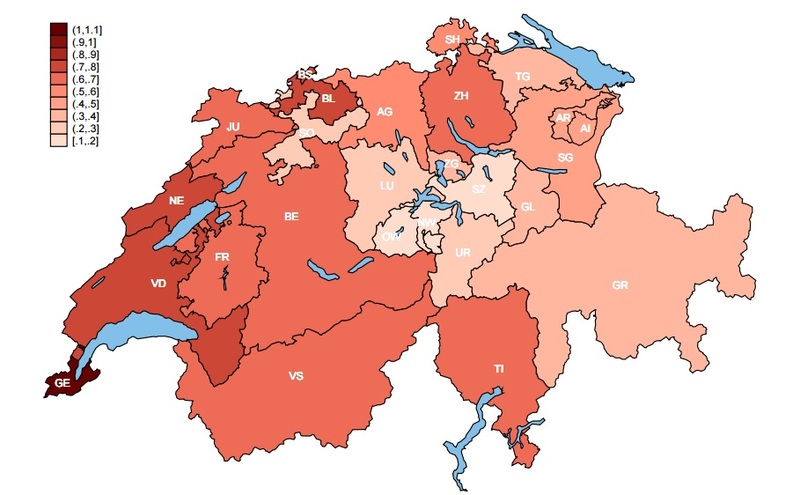 Here are the wealth tax rates in the various cantons, based on a recent study of the system. As noted in the WSJ story, that study contains strong evidence that the tax is hurting Switzerland. …according to a new paper, …taxing wealth leads declared wealth to disappear. Based on experience in Switzerland, which uses wealth taxes the most, reported wealth falls around 20 times as much in response to an increase in a wealth tax as it does to an equivalent increase in a tax on capital income, such as dividends or capital gains. …Economists at the University of Lausanne and Massachusetts Institute of Technology found that a 0.1 percentage point increase in Swiss wealth taxes caused a 3.5% reduction in reported wealth. That’s equivalent to 100,000 Swiss francs going missing for a person worth 3 million francs. …they conclude in a study investigating changes in wealth tax rates on Swiss taxpayers’ reported wealth from 2001 to 2012. Why is there such a big response? For the same reason that class-warfare taxes don’t work very well in the United States. Simply stated, taxpayers have considerable ability to rearrange their financial affairs when governments try to tax capital (or capital income). And that ability is especially pronounced for those with higher levels of income and wealth. Individuals have greater control over their reported wealth–especially financial wealth such as bank deposits, stock and bonds–than their reported income. By the way, the story also included this nugget of good news. Thanks primarily to tax competition, many nations have eliminated wealth taxes over the past 20 years. …only five members of the Organization for Economic Cooperation and Development still levy annual taxes on individuals’ total financial and non-financial wealth… That is down from 14 nations two decades ago. And if you want more good news, the Swiss cantons also are lowering their tax rates on wealth. Here’s another map from the study. It shows that a couple of French-speaking cantons have imposed very small increases in the tax since 2003, while the vast majority of cantons have moved in the other direction, in some cases slashing their wealth tax rates by substantial amounts. Since I’m a big fan of Switzerland, let’s close with some more good news about the Swiss tax system. Not only are tax rates on wealth dropping, but there’s no capital gains tax. And there are no taxes on interest. So while there is a wealth tax, which is a very unfortunate and destructive imposition, the Swiss avoid many other forms of double taxation on income that is saved and invested. *The burden of government spending also is excessive in Hong Kong and Singapore. Based on historical data, economic performance will be maximized if total government spending is less than 10 percent of GDP. A wealth tax would have devastating effects on economic growth, regardless of the country that tried to enact one. Under a flat tax, those who make more still technically pay more than low and middle income families in terms of dollar amount. The idea of a wealth tax would be economically devastating. Regardless of the country tried to enact one. @Masgramondou: you assumption is wrong. Please learn better about the system. From what I recall of Swiss taxation, the actual taxes paid for high net worth individuals is entirely negotiable with the cantonal tax authorities. I.e. while they have a “rack rate” income and wealth tax, you can come to an agreement that is lower so long as you make a binding multiyear contract. The trick is that you commit to some fixed amount of francs to pay as tax per annum for N years (the amount may be static or it may increase YoY). If you lose money and aren’t wealthy anymore you still owe the taxman and IIRC the local canton will have first dibs on your assets should you fail to make the tax payments you agreed to.